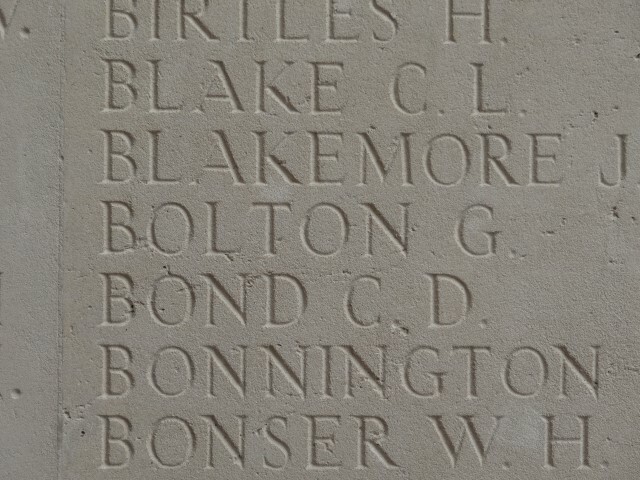 35057 Private George Bolton 10th Battalion, King’s Own Yorkshire Light Infantry was killed in action 25 September 1916 and is commemorated on the Thiepval Memorial. He was 31 years old and is commemorated on the West Auckland War Memorial and the Roll of Honour in West Auckland Memorial Hall. The 10th (Service) Battalion, the King’s Own Yorkshire Regiment was formed at Pontefract as part of K3, Kitchener’s New Army and came under the orders of the 64th Brigade, 21st Division. The Division arrived in France in September 1915 and took part in the Battle of Loos, 25 September – 8 October, as part of XI Corps First Army. 64 Machine Gun Company joined March 1916 left February 1918 to join the 21 MG Battalion. 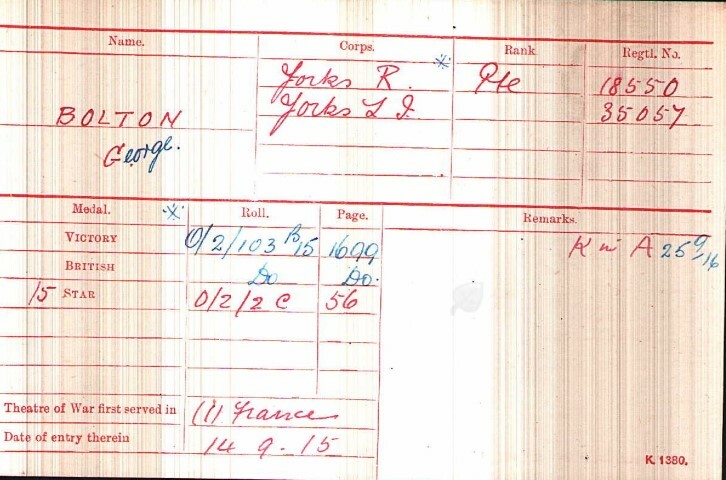 Private G. Bolton was killed in action 25 September 1916. As was customary, the offensive commenced with an artillery bombardment which opened up 24 September. On this occasion, the Germans had no time to deepen their trenches or prepare deep dugouts, concreted machine gun posts and massed belts of barbed wire. The infantry went over the top at 12.35, 25 September. The offensive purposely coincided with a French assault to the south. The Royal Artillery blasted a “creeping barrage” and the infantry followed into No Man’s Land. Tanks were to be used in the attack behind the troops and concentrate their fire power on specific strong German positions. The village of Gueudecourt was still holding out as night fell. In many places along the line the troops of the XIV Corps met little opposition from front line Germans and they smashed their way through. The village of Combles was left isolated and the Germans had to abandon it the next day, 26 September. Gueudecourt was finally overrun on the afternoon. By the conclusion of this offensive, the final objectives had been achieved and in addition land had been captured beyond the villages of Lesboeufs and Morval. 35057 Private G. Bolton was awarded the 1914-15 Star, the British War and Victory medals.